This is the 2nd instalment in a series that looks at how the elite swim the 200. This time we’re analyzing the 200 backstroke for women. Thanks to a lot of suggestions, and some renewed thinking about the data, I’ve focussed this a little differently than the 200 Free analysis (link). First off, I’ve completely dropped the analysis of 100 splits, since it’s all inherently included in the 50 splits anyway. I’ve also included additional analysis of the importance of each 50 in the race. Lastly, I’ve added some analysis of why the top 8 were faster than the other 16, and then why the fastest person is the fastest. Unfortunately, it has become so lengthy that I can only deal with the women in this post. The data set consists of 24 elite women at the time of the 2012 Olympics. I used the Olympic finalists and semi-finalists as 16 of these swimmers, and then filled in the rest with the US Olympic trials finalists and semi-finalists. For each swimmer, I used the fastest time they swam during the competition. I also knew that I would have to look at more than raw splits, as in order to compare sprinters to more distance-oriented swimmers, and to provide value to non-elite swimmers, I’d need their 50 Personal Bests [PBs] as well. For a few swimmers I either had to infer their 50 PB from their split on a 100, or else exclude them from the analysis. Here we are looking to determine the different strategies elite swimmers use in the 200 backstroke. Usually different strategies are based on whether the swimmer is more sprint-oriented, endurance-oriented, or those with elements of both. We had an excellent example of that with the 200 Fr analysis. I’ve included Katie Ledecky’s results below to show how the top female distance freestyler of the Olympics swam the 200. Keep in mind that the last 50 should be slightly faster for all strokes, as there is no turn at the end of the race. In order to determine the profile types used in the 200 Backstroke I grouped the swimmers according to their 50 PB. The 8 swimmers with the fastest 50 PBs would be part of the Top 50 PB group, followed by 8 more in the Middle 50 PB group, and then the remaining 8 in the Bottom 50 PB group. Here’s the result. A couple of things stand out here. First of all, the right-most column in the table verifies that we have significant differences in average 50 PBs between the different groups of elite swimmers: 28.24 vs 29.02 vs 29.9. For a 50, these are huge differences. If there are consistently different profiles between the groups, we should see them. We next see a totally different result than we had with the 200 freestyle, which clearly showed the three profile types. Here we see that that all 3 groups ON AVERAGE look like distance profiles. None of these groups have the gradually slowing nature of the sprinter profile, or even the flat ending of the hybrid profile. I then looked at the raw data, and found that of the 24 swimmers, 6 swam the race with a sprinter’s profile, and 2 with hybrid profiles. This included 3 sprinters and 1 hybrid in the top 8, and another 3/1 spread throughout the slower half of the field. It would appear that the women’s 200 backstroke is predominantly swum as a distance event, although 3 of the top 8 women swam it with sprinter profiles. We know what the offset 50s look like with swimmers grouped by their 50 PBs. Now let’s look at their raw times. As with the 200 freestyle analysis, we find that the swimmers with the fastest 50 PBs have the highest offsets (farthest from their PBs), while the swimmers with the slowest 50 PBs swim closest to their PBs. This actually makes sense. The Bottom 50 PB group have average 50 PBs 1.8 seconds slower than the Top group. In order to be remotely competitive, the slower PB group has to swim closer to their PBs than the Top Group. Why are the Olympic Finalists Better Than the Other Elite Backstrokers? Our data has 24 of the top women’s 200 backstrokers in the world. We’re next going to look at the what the top 8 (who happen to be the Olympic finalists) are doing that makes them better than the other 16. The best way to do this is to try to identify some specific aspect of the race that the top 8 do differently than the rest. Examples of this aspect could be their 50 PB, 1st 50 split, last 50 split, etc. And to measure the impact of this specific aspect, we’ll group the 24 swimmers into 3 groups of 8 according to this aspect, determine the Top aspect group average 200 time, and then compare it to the 200 time average of the top 8 200 backstrokers. The smaller the difference between the two averages, the more important that aspect of race. What jumps out at us right away is the important of the 3rd 50 split. There is only a tiny 0.08 second difference in the 200 averages. This basically means there is almost a direct match between the swimmers with the fastest 3rd 50 split and the swimmers with the fastest 200 times. The next important thing to notice is that the splits for ALL four 50s are strongly correlated with the 200 time. In other words, these top 8 swimmers are fast and very consistent. Nobody was saving up energy for that 3rd 50. In fact, the 2nd 50 was almost as important and aggressive as the 3rd 50. We can also see that the 50 PB is a good indicator of the 200 final times, but not nearly as good as the 50 splits. 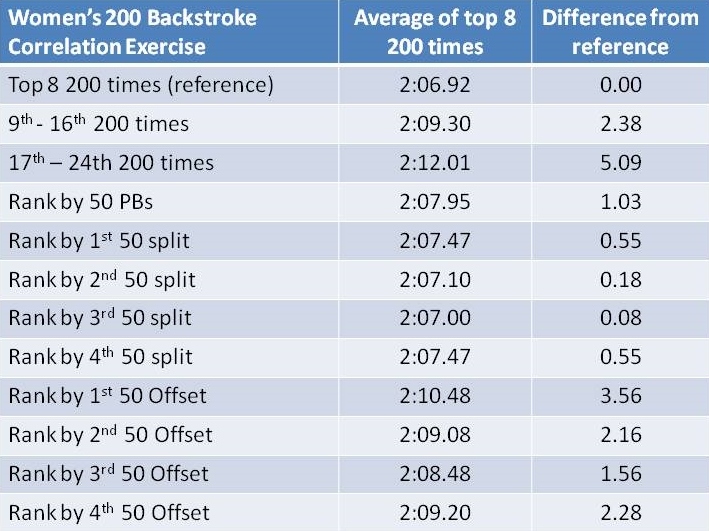 Basically, the top 8 are the top 8 because they are consistently fast, especially during the 2nd and 3rd 50s, and are generally aided by good 50 PBs that allow them to swim fast without having to swim near their PBs. Next, we’re going to drill down a bit deeper and try to figure out why Missy Franklin is the best of the best. This first graph shows the raw 50 splits for the top 8 swimmers. We can see that Missy Franklin is clearly fastest on each of the first three 50s, and still near the fastest on the last 50. Franklin, Coventry, and Simmonds were the only ones with sprinter’s profiles. Here is where we see that Franklin’s very fast 50 PB helps her out, as she achieves her significant race lead with offsets that are in the middle of the pack for the 1st, 3rd and 4th 50s. Only in the 2nd 50 does she really put in a better offset than everybody else other than Elizabeth Beisel, who I suspect has a much better 50 PB than her official results indicate. It appears that Missy Franklin uses her great 50 PB to allow her to take it out faster than everyone else without too aggressive an offset, and then swims a sprinter’s profile with very aggressive 2nd and 3rd 50s. She finishes off with only the 4th fastest last 50, but this is more than enough for her to win the race by almost 2 seconds. We have basic profiles for sprint-oriented, distance-oriented and hybrid swimmers doing the 200. Below is the 50 PB table from the 200 Free analysis that shows the different splits breakdown for these profiles. I didn’t adjust for a dive start versus an in-water start simply because the freestyle and backstroke offsets are so similar. There should be a difference for the two strokes as the freestyle PB was done with a dive, but the data doesn’t support this difference. But I did round up to the next tenth of a second. We can use these offsets to work backwards from a 200 goal time to determine a set of 50 splits. This table shows the method. We’ll use a goal time of 2:10.00, and we’ll run it for all three profiles. 2. Determine the 200 time if you swam the race like the elite. We can also use the profiles of these elite swimmers, and the swimmer’s 50 PB to come up with their 200 time. Let’s assume a 50 Backstroke PB of 32.0, and we want to know how fast you would go with elite-type profiles. The elite women swim the 200 backstroke primarily as a distance event, with only a few swimmers using a sprinter’s (gradually slowing) profile. In general, backstrokers with the best 50 PBs swim with higher offsets, while those with higher PBs have to swim closer to their PBs. The top 8 swim a very consistent race, with very fast 2nd and 3rd 50s. The Olympic champion, Missy Franklin swims the race far more aggressively than everyone else. Despite having a blazing fast 50 PB, she swims the 2nd and 3rd 50s with some of the lowest Offsets in the field, using a sprinter’s profile to finish off slower, but still far ahead of the field.